This will be my last Flower Market project I post for a little while because I have some other things that I need to get busy on but I know I will be using this cart quite a bit in the future. I have made cards in the past with bee's on them and I always love making those type of cards *okie thinks it rather odd that she makes cards with bee's and not ladybug's since ladybug's should be the obvious choice* so when I saw the bee and honeycomb on the cartridge I knew I was gonna be hittin' those images up. 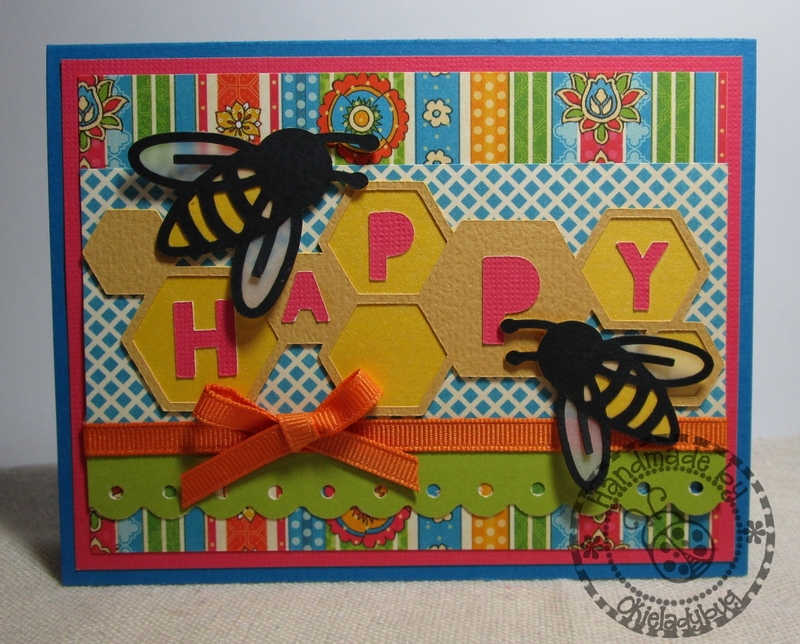 I was pleased with how this card turned out and I didn't even ink any edges. I think with the bright colors of the patterned paper inking just wasn't necessary. Some folks might recognize the paper but for those who don't it's Graphic 45 Bohemian Bazaar. The little bee didn't have any wings so I had to make some. Well I guess he had wings but just the outline and line down the middle. I had to use the contour feature to hide the parts that I didn't want on the wings that I cut out of the transparency paper and I like how it turned out. I used some yellow mica paper for the body of the bee and the just some black cardstock for the top layer. Sorry for such a short post but I'm low on time today. If you would like to order this cartridge just go to CTMH FLOWER MARKET COLLECTION. Very cute. 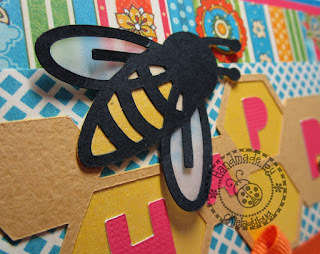 Love the bee and the honeycomb.